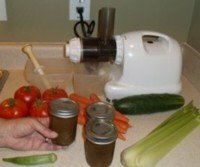 Benefits of juicing vegetables come from the health advantages of each. to nutrient dense fruits and vegetables. CABBAGE Vegetable. One of the benefits of juicing vegetables is found in cabbage. Though a strong flavor, Cabbage is rich in yttrium and selenium, and great for colon health, since it coats the digestive system and helps to protect it. Cabbage might also be helpful for healing stomach ulcers. CANTELOUPE Fruit. I grow these in my garden. I always try to add a little fruit to my juice, and cantaloupe is a good choice of fruit for juicing. You can cut in half, clean out the seeds, then scoop out the flesh and put through the juicer. Or if your juicer can handle it, you may juice rind, seeds and all. CARROTS Vegetable. Help to stimulate and improve overall liver function. May help reduce insulin resistance. Carrots are also a great source of potassium and selenium. Talk about benefits of juicing vegetables! Cut off tops and ends before juicing. CARROT GREENS Dark Green. Carrot greens are rich in vitamins, especially vitamin K, and phytonutrients, and may be juiced. They are rich in potassium, which gives them a bitter flavor, so be cautious of adding too many to your juice. Some people can have an allergic reaction to carrot greens, so once again, exercise caution. CATNIP Mint. While it seems to drive cats crazy, catnip can serve as a sleep aid for humans, as it has a mild tranquilizing or sedative effect. CAULIFLOWER Vegetable. Since the florets don’t contain much juice, we juice the base (cut off the brown bottom) and use the florets in salads or stir fry. The green leaves are also juicable and nutritious. They have a strong cabbage flavor. CELERY Vegetable. Stem and leaves may be juiced. Leaves add a little bitter flavor. Helps to cleanse the digestive system of uric acid. We juice 3 or 4 stalks of celery, since it contains key benefits of juicing vegetables. CHARD Dark Green. An excellent source of vitamins C, E, and K, carotenes, chlorophyll, and fiber, plus magnesium, iron, manganese, and especially high in potassium and selenium. CHERRIES Fruit. Cherries are known to help reduce uric acid, and can help prevent the inflammation caused by gout. Juicing parsley (a good diuretic) along with cherries will help to flush the uric acid from the body. CHERVIL Herb. A close relative of parsley. Sow seeds generously, as germination is poor, and takes about 2 weeks, though it is a fast growing plant. It has a mild licorice like flavor comparable to Anise. CHICORY Herb. Has a strong bitter flavor, so is best to add items like carrots or celery to tame down the taste. Both the leaves and root may be juiced. Helps with cleansing of the liver. CHINESE BITTER MELON Fruit. This fruit ranks high for benefits of juicing vegetables, since it is widely acclaimed to help in lowering blood sugar levels. CHIVES Herb. A delicately flavored member of the onion family. Seeds do not remain viable for long, so best purchased as a starter plant. Snip the leaves before it has a chance to develop flowers. Stems and leaves may be juiced. CILANTRO Dark Green, Spice. When looking for benefits of juicing vegetables, don't forget cilantro. It is rich in antioxidants and essential volatile oils, and is also rich in vitamins and minerals. Cilantro, together with Chlorella, are the two key plants for helping to flush mercury from the body. It’s leaves and stems may be juiced, and have a strong, pungent flavor that many find appealing. COLLARD GREENS Dark Green. It is rich in chlorophyll and highly nutritious, collards are said to offer protection against hemorrhoids, constipation as well as colon cancer diseases. COCONUT MILK Fruit. Start with a ripe coconut. Open it, save the coconut water, pry out the coconut meat, combine the meat and coconut water in a blender, then put it through the juicer. A large coconut can yield up to a pint of ultra healthy coconut milk. This can be added to your vegetable juice as a source of protein. CORDYCEPS Herb. A small mushroom that resembles grass, cordyceps are great for the lungs, and beneficial to those with a weak respirator system. It enhances energy so that physical labor is easier. They are known for their anti-aging properties. Use cordyceps to maximize your benefits of juicing vegetables. CORN Vegetable. Corn may be juiced, and contains many nutrients, but has high sugar levels, so it can easily spike blood sugar levels. It is best to purchase organic corn or juice corn from your garden, as most corn that is grown is genetically modified. CRANBERRY Fruit. Boosts metabolism and helps to dissolve fat, plus are a good diuretic. Anti-inflammatory that is helpful for those battling with diabetes. CRESS Bitter Green. Watercress has a hot, sharp and biting flavor. It is highly nutritious, and an excellent source of vitamins B6 and C, plus carotenes and manganese. CUCUMBER Vegetable. Cucumber is a wonderful natural diuretic, and helps with urination. It is helpful for kidney, pancreatic, liver and bladder disease. It contains the enzyme erepsin, which helps in the digestion of protein. Cucumber juice, together with carrot, lettuce and spinach juice, helps with hair growth, and cucumber and carrot juice are said to help alleviate the inflammation, swelling, and pain in joints and muscles caused by excessive uric acid. Cucumber juice is valuable against diseases of the teath and gums, and it’s high mineral content helps in preventing splitting of fingernails and toenails. These are many of the benefits of juicing vegetables that I look for, so we always include a half or even a whole cucumber in our juice. DANDELION GREENS Dark Green, Wild Green, Herb. Dandelion is bitter. It helps with general detox, especially with cleansing the liver. 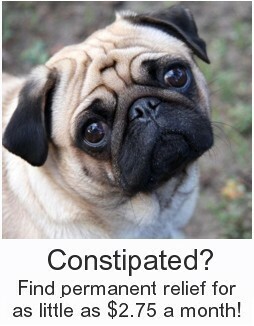 Helps with digestion. 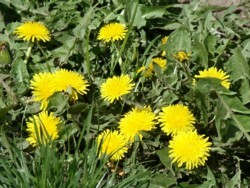 One of the benefits of juicing vegetable found in dandelions is the chlorophyll. And we thought dandelion was a weed? DILL Herb. It’s leaves may be used in juice, but use sparingly, as a bit of dill taste will go a long way. It is a good source of calcium, manganese and iron. Dill contains flavonoids, known for their antioxidant, anti-inflammatory and antiviral properties. ENDIVE Bitter Green. Bitter flavor. Helpful for weight loss and as a light laxative. It is rich in vitamins and minerals, and contains essential amino acids, fats, and starch. EGGPLANT Vegetable. In the same family as tomatoes, potatoes and sweet peppers, one of eggplant’s main health benefits is its ability to lower bad cholesterol. It is linked to improved brain activity, and contains the powerful antioxidant nasunin. ESCAROLE Dark Green. Also known as Endive. Has a bitter flavor. Helpful for weight loss and as a light laxative. It is rich in vitamins and minerals, and contains essential amino acids, fats, and starch. Vegetables can taste so much better when harvested from your own garden. 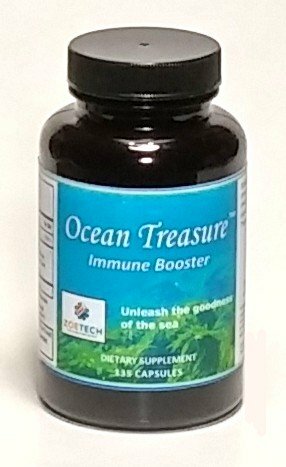 I use a product with sea minerals, and what I grow tastes really good. Others who have used sea minerals have also found this to be true. Happy juicing!